AleaSoft, February 4, 2019. 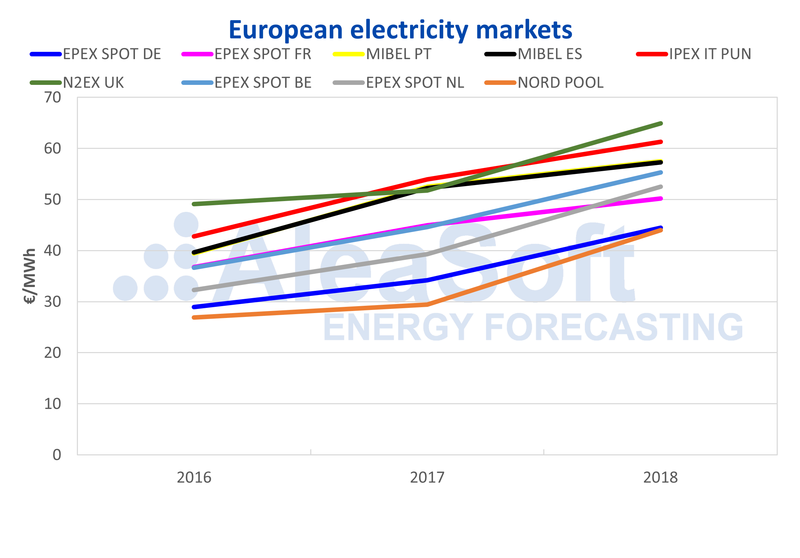 AleaSoft analyses the behaviour of the European electricity markets at the beginning of 2019 and the outlook until the end of the year. The price of Brent oil futures in the ICE market for April starts the week of February 4 with a slight trend to exceed 63 $/bbl after being three weeks ranging between 60 and 62 $/bbl although in general the trend is stationary. The situation in Venezuela remains a latent factor that is destabilizing the oil market. In AleaSoft, we consider that taking into account the slowdown in the growth of the economy, Brent will continue on the path of 60 $/bbl in the mid-term. TTF gas futures for March fell below 20 €/MWh in early February for the first time since mid-April last year. 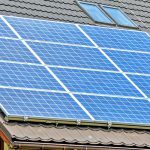 The maximum values were reached in September when they were close to 30 €/MWh. At the beginning of this year, these futures were at 22.17 €/MWh confirming a downward trend that can continue. API 2 coal futures for March continue in the same way with a slight downward trend with the possibility of falling below 77 $/t. At the beginning of October last year, they were trading above 100 $/t. At the beginning of the year they were at 84.80 $/t. As we discussed in AleaSoft last week, this downward trend in gas and coal that has continued can influence declines in the prices of European electricity markets in the coming weeks when weather conditions are more favourable and temperatures rise. On futures prices of CO2 emission rights, for the reference month of December 2019, the last closing value on February 1 was just under 22 €/t. This year began with values above 25 €/t that fell rapidly to 22.04 €/t on January 19, then climbing to its maximum at 25.20 €/t on January 22. At AleaSoft we consider these 22 €/t as an equilibrium value. At the end of January 2019, the prices of the main European markets rose with respect to January 2018. From more than 20% of the MIBEL market in Spain and Portugal and the N2EX market in Great Britain, up to 75% of EPEX SPOT France. Values around 65% in the cases of EPEX SPOT Germany, EPEX SPOT Belgium and Nord Pool. In the case of the IPEX market in Italy, the year-on-year increase was 38% and the EPEX SPOT in the Netherlands was 50%. 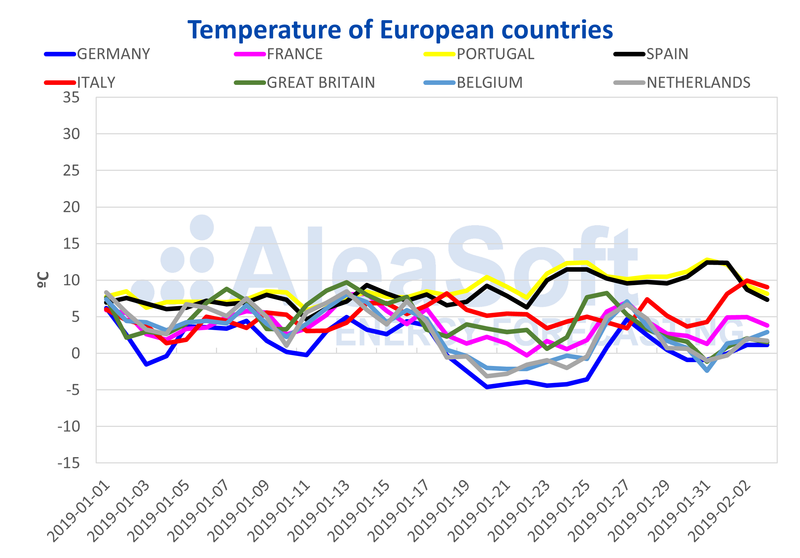 In AleaSoft it is considered that, taking into account the evolution of fuels, CO2 and temperature forecasts for the coming weeks, prices should fall to a path of around 50 €/MWh. FSources: Prepared by AleaSoft with data from ENTSOE, RTE, REN, REE, TERNA, National Grid and ELIA. 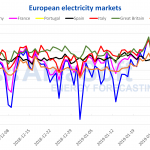 The electricity futures of France and Germany in the EEX market for March 2019 have followed a downward trend since the end of last year. In the case of French futures, on December 17, 2018, they closed at 60.05 €/MWh and on Friday, February 1, they were traded 9.83 €/MWh below, at 50.22 €/MWh. For its part, the futures of Germany for March 2019, were traded on December 17 at 54.17 €/MWh and on February 1 at 47.06 €/MWh, that is, 7.11 €/MWh lower. Spanish and Portuguese futures in the OMIP market have also maintained a bearish trend since the end of December. On December 17 last year the futures of Spain for March 2019 were traded at 59.83 €/MWh and those of Portugal at 59.99 €/MWh, and at the end of last week, on February 1, they were traded at 52.10 €/MWh and 51.73 €/MWh, respectively, which represents a difference of around 8 €/MWh. 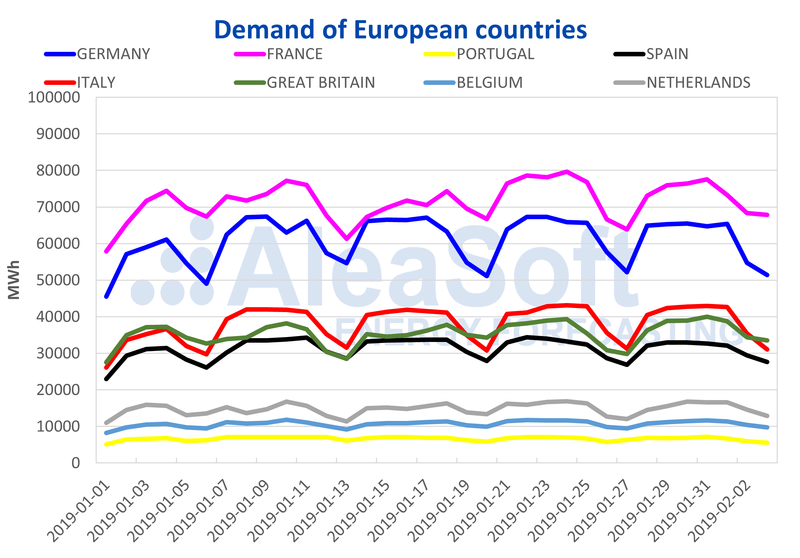 The decline in electricity futures for March 2019 is common for most European markets. UK futures in the ICE market decreased by 11.31 GBP/MWh between December 17, when they were trading at 64.40 GBP/MWh, and on February 1, when they were trading at 53.09 GBP/MWh. Those in the Netherlands, also in the ICE market, dropped 11.45 €/MWh on the same dates, from 62.59 €/MWh to 51.14 €/MWh. 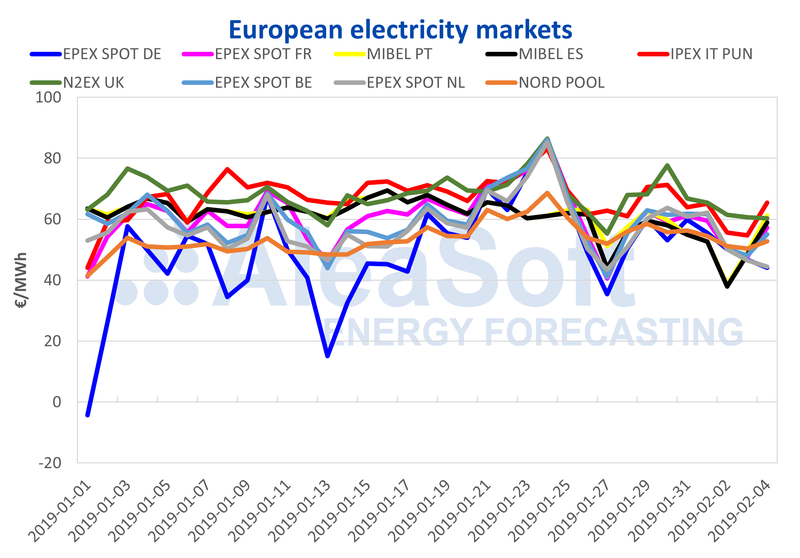 In Belgium, also in the ICE market, the futures fell by 8.92 €/MWh, from 60.74 €/MWh on December 17 to 51.82 €/MWh on February 1 and those of Italy, in the EEX market, went down by 9.13 €/MWh, from 67.73 €/MWh on December 17 to 58.60 €/MWh on February 1. As shown in the following table, the prices of fuels and CO2 emissions have been rising since 2016. That led to an increase in prices in the years 2017 and 2018.